Every player will be able to do 3 attempts under Tomb of Faith Daily! Every 00:00 attempts resetting. During the task player will need to conquer 5 Waves of monsters and Bosses! Each next wave will be harder (more monsters and stronger). Along with monster/bosses strength drop chance is better (in % chance and possibility to gain more unique items!). There are 4 difficulties of this task – they are divided by Monsters Powers (vs player Battle Powers!) – so its not suggested for players under certain BP amount to enter to high maps! Depending on difficulty its possible to drop loads of possible drops – Each boss has BASE drop that will be mostly repeating + many chances for rewards like skin shards, follower shards, through universals of all type, boxes, ep bags (10-1000) and items like oracle stones, genesis stones, god tears etc etc (list of possibilities is HUGE!). CHANCE of Drop: chance is not hard – but you must always rememeber its all about luck :/ Even when chance is around 10-30% to gain the good stuff – its not same like you will get it! Besides Bosses drop – monsters inside tom can randomly reward player with Newbie or Killer boxes directly to bag! Every time when player face Boss will be awarded with Score of Tomb! First Boss = lvl 1 score, level 5 boss = 5, lvl1 normal = 6, lvl 1 hard = 11 etc until MAX 21 that can be obtained after killing Lvl 5 Boss at Hell difficulty! If you kill higher lvl Boss and later kill lower – your score will be downgraded (this might change in future but until then lets see :)). TOMB Score will be counted to GPP (Global Player Power – you will all know soon). 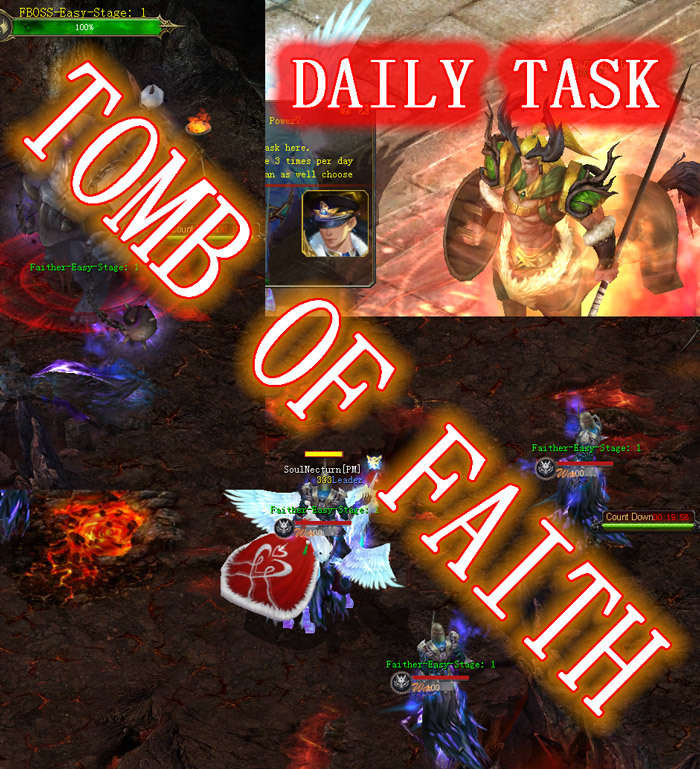 0 Comments ON " TOMB of FAITH – Daily Quest "